← Why is My Face Shrinking? I’m at my wit’s end. I know I’ll never be able to have a perfect smile, but I was hoping for something at least not humiliating. I have crowns on my two front teeth. They’re over 15 years old and starting to show their wear. They’re stained and starting to crack. I just wanted to replace them and maybe whiten my teeth if I still had enough money. However, my dentist is insisting I get braces on my teeth before I get my crowns re-done. I just can’t afford that. Is it truly necessary? My teeth stick out a little, but not that much. Why was the last dentist able to do crowns? This is one of those situations which truly frustrates me. Some dentists will insist on only doing the ideal no matter what type of burden that places on the patient. This is unfair. It’s obvious your crowns need replacing and he’s putting you over a barrel. As you said, your last dentist was able to do the crowns, why isn’t this one? I think in this case you may need to see a different dentist to get the treatment you want without it costing you a fortune. You can completely do without braces, or you could just get them later if circumstances changed. If you’re serious about getting your teeth whitened, it will save you a lot of money to get them whitened before you have the crowns made. It’s possible to get your teeth whitened in one appointment these days with in-office teeth whitening. That will save you time. If you wait to whiten your teeth until after your new crowns are made, they won’t match. The whitening gel only works on natural tooth structure, which means your teeth will whiten but not your crowns, causing you to need to purchase new ones unless you want mismatched teeth. Doing the tooth bleaching first prevents that. If somewhere in your future, you decide you do want orthodontics, you should know it no longer means you have to get uncomfortable wires and metal all over your teeth. These days, Invisalign is a great alternative to traditional braces. 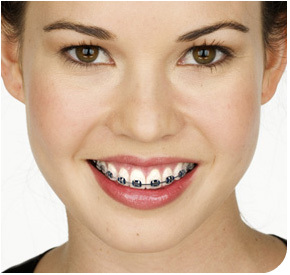 They use clear plastic aligners which are invisible even at a conversational distance. One other thing to note. Because the crowns are on your front teeth, make sure whatever dentist you settle on gives you all-porcelain crowns. They’ll look much more natural. This blog is brought to you by Glenpool Dentist Dr. Ryan Noah. This entry was posted in Orthodontics and tagged all porcelain crowns, braces, Glenpool Dentist, Glenpool Orthodontics, Invisalign, teeth bleaching, teeth whitening. Bookmark the permalink.